Purchases in the northern suburban county -- which shoulders the biggest property-tax burden in the U.S. -- plunged 18 percent in the second quarter from a year earlier, the most since 2011, according to a report Thursday by appraiser Miller Samuel Inc. and brokerage Douglas Elliman Real Estate. It was the fourth consecutive quarter of sales declines. 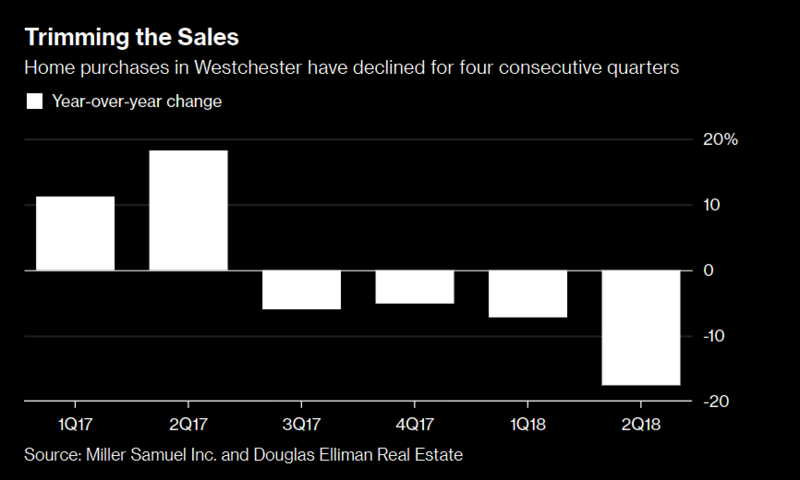 "We’re seeing buyers take a second to understand the math," Scott Elwell, Douglas Elliman’s regional manager in charge of Westchester and Connecticut, said in an interview. "They’re spending more time with their accountants and really understanding how this plays out." The reason, according to Bloomberg, is that home buyers have been deterred by the county's high property taxes. Federal rules approved in December set a $10,000 limit on deductions for state and local taxes, which is nearly half the $17,179 average tax paid by Westchester residents in property taxes last year. While the reasons why cashed strapped millennials aren't buying are obvious (they don't have any money), maybe wealthy people who have an understanding of how markets work aren't buying because they think that they might be able to get a better deal if they wait a year or two. And they might be right, especially if Republicans retain control of Congress in November, which would greatly reduce the likelihood that the Trump tax cuts will be repealed.